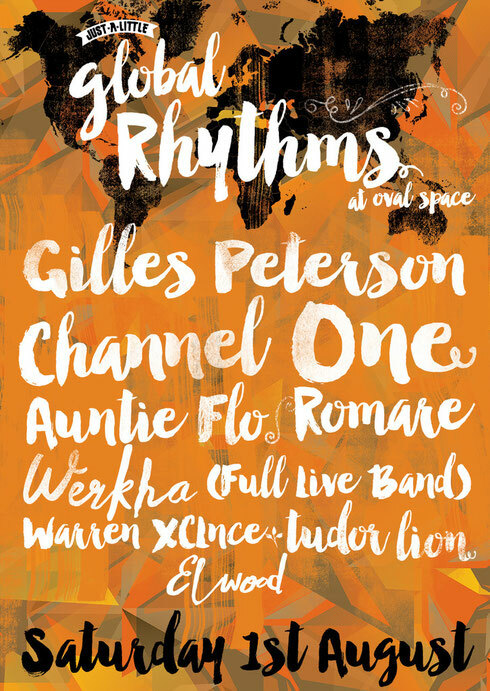 Just a Little and Tremors are joining forces again for Global Rhythms, a 15-hour day and night terrace party bringing a palette of worldwide flavours to Oval Space in London. Heading up the bill is Gilles Peterson, who from his cult BBC 6 Music show to seminal Brownswood label and beyond, has possibly become over three decades one of the most influential figures in UK music as he champions artists from all around the world. Apparently Channel One Sound System are possibly one of the world's foremost dub reggae sound systems. Running for over 30 years, they say it's not a carnival if you haven't had a taste of Channel One - Notting Hill embodied. Two time winners of Red Bull Culture Clash, get set for righteous vibes and bottom-heavy anthems. Joining them are Auntie Flo and Romare, two Afro-tinged house/techno producers on the block and eclectic DJs to boot. Werkha will also be in the building with his full live band. With releases on Tru Thoughts & Brownswood, plus support slots for Bonobo and Chet Faker, it may not be long before his quirky take on soulful jazz grows internationally. To keep you going all day and night, White Men Can't Jerk will be stationed on the terrace doing their thing - serving up Caribbean delicacies.